PDF format here, full document here. Looking from the ocean, the building consists of four stories and an attic, while from Point Lobos Road, beside the attic, there are only two clear stories. The lowest one is devoted to the polishing of shells, manufacture of curios, and the electric plant for the lighting of the house and the running of the elevator, and contains sleeping rooms for the necessary attendants. On the second floor refreshments will be sold at the price of city restaurants. There are twenty dining rooms on this floor, also shell and curios rooms. 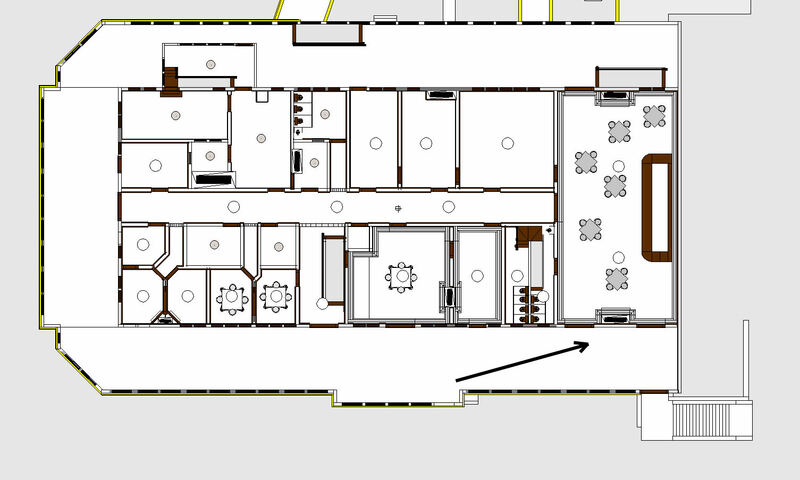 The third floor doors can be enlarged or diminished at pleasure. The attic is used chiefly as a means of approach to the rooms in the turrets, three of them fitted up as private dining rooms, and the fourth containing the largest camera obscura west of Chicago. Springing from the main roof, in its center, rises the handsome square tower, which, according to present plans, is to be used as an observatory room for from which coining of vantage, visitors may enjoy the magnificent and extensive view of the sea and shore, of plains and lofty mountain chains. 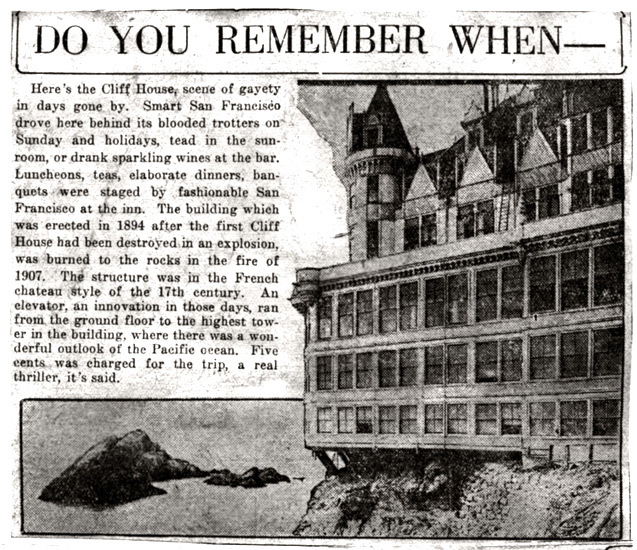 A verandah, 16 feet wide, open at the fourth but enclosed by glass on the lower three floors, runs around the ocean side of the Cliff House. 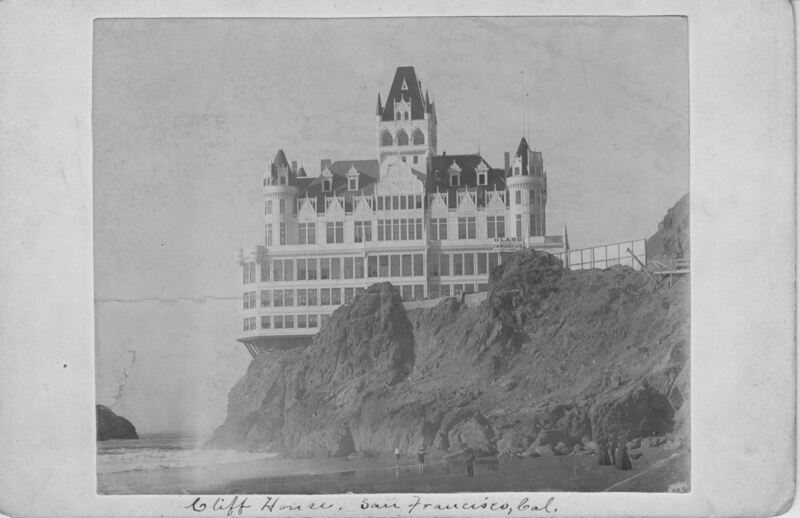 The inside fittings and furniture have been chosen by Wilkins [probably referring to James M. Wilkins, the manager of the previous Cliff House that the Victorian one replaced] and Pearson, and are in keeping with the style and beauty of the building. The main story was at street level and was complete with a parlour, a small retiring room adjoining the parlour on the west. Four small dining rooms were separated from the parlour by a hall running east and west through the center of the building, and on the south side near the center were six small dining rooms. 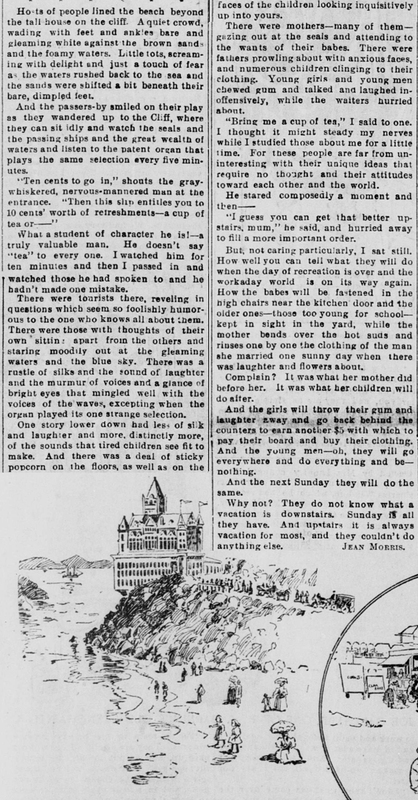 There was a main dining room, a shell room, a kitchen, and a pantry. South of the east dining room was a hallway and broad stairs leading to the above storie. There was also a large vestibule on the south-east corner. On the floor beneath the main storie there was a barroom, and dining room and parlour on the south-side. Four small dining rooms, a butcher shop, refrigerator and wineroom were also located on this floor, and east of them another kitchen. 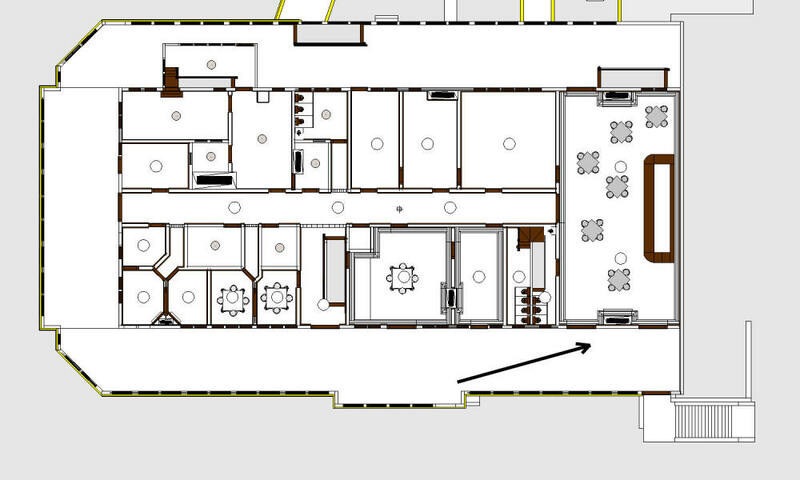 There was also an employees dining room, and on the north side an eight foot corridor extended through the center. The corridor connected a veranda with the main stairs leading to floors above and below. The lower level was arranged with a laundry room, work shops, corridors, and twenty sleeping rooms for employees could be found in the basement. The attic had two floors. The upper part of the large tower was a big room used for an observatory, having one of the finest marine views.